I am super happy to have the chance to write this post about Meg. A lot has happened since I was rooming with Megan at the end of last summer for Grand Prix. I remember that time in Argentina as being especially difficult for multiple reasons; we were just finishing up three weeks on the road, we were out in the boonies somewhere in Argentina, and Connor’s one-year anniversary was comin' around the corner. However, with a teammate and (luckily) roommate like Megan, it wasn’t as difficult as it could have been. She has the ability to make anyone around her burst out in fits of giggles and bring the best out in everyone, on and off the court. She is hands down themost hilarious individualI know - her actions, her stories (you get to read a couple of them at the end of this post), and anything out of her mouth is just pure gold. Rooming with her was filled with extra workouts together, morning jogs around the hotel’s “back sixty”/farm lands(I know.. we're weird), recording the sleep-talking conversations that were happening at night, talking about sugar addictions (it’s so real), and really in-depth conversations about life. Shortly after Grand Prix, we found ourselves at World Championships in Italy, which was an incredible experience. That week however, Megan got some devastating news; her best friend’s dad had passed away. Both their families were incredibly close and more than once Megan had referred to her friend’s father ashersecond dad. Needless to say, it really shook her. She spent a lot of time in mine and Dana’s room as we talked things together and tried to make sense of it all. Her heart is so kind and so strong. Her biggest concern was if she stayed in Italy with us, how could she be supporting the families the way her heart wanted to, but if she left, what that would mean for us. In the end, she finished World Championships and did it with a little more fight and passion. She had told me before that she felt he wasand is really with her. That volleyball is what he would want her to be doing. Meggy-Meg is really an incredible athlete. She grew up and went to school in Selkirk, Manitoba and played every sport that was offered. Her main passion was figure skating but once sports started becoming more time consuming, she decided to focus her energy on basketball and volleyball. At 14 she made both the volleyball and basketball provincial teams but had to choose which one to pursue. How did she decide you ask? Volleyball has less running. So that was that. The summer of 2006, Megan made the Youth National Team and competed in the NORCECA Championship in Florida. She mentions that this was a very large eye-opener for her; it was her first summer away from home and training at the U of M. Despite stepping way out of her comfort zone she was so inspired and took photos of everything – the campus, the people, the stores, and finally decided that she would play college volleyball in the States. Meg went to Lord Selkirk Comprehensive High-school and won the AAAA Provincial High-school Championships every year. They created a club team, which consisted of a lot of their high school team and a few other players from surrounding areas. One special teammate was Tabi Love, who is our starting right side on the National Team. Their club team won club nationals two years in a row in 2007 and 2008. Both girls were huge parts of those wins (and their incredible on-court connection is still so present to this day). After finishing high school with some prestigious awards, she went down to the University of Colorado in Boulder after falling in love with the school during a few on-campus visits the previous year. The summer before heading down to CU, Megan competed with the Junior National Team and then went straight down to Colorado to effectively begin her college career. However, upon arrival her coach told her that she would be red-shirting her first year. Not many star athletes would rise to this new challenge, especially coming off of an incredibly star-studded high school career... but Meg did. Asking her about it she replied with,"I didn’t really know what that [red-shirting] meant but I am so thankful that coach decided to do it. I spent the entire season on the bench and was essentially a practice player. It allowed me to have an extra year of eligibility which I was so thankful for." A hidden blessing as the next year their coaches got fired and as the new ones came in, they were ready to force a large turnover within the team. The year was a disaster to say the least. It was Megan’s first year to play and she remembers losing all confidence in herself and her skills that year. She was emotionally beat down and was forced to play almost every position; setter, defensive specialist, serving sub, and her debut as a middle blocker (I hope we can dig up a highlight reel). Her coaches put her in as a middle against one of the best teams in the Big 12… not her favourite life experience. After barely surviving through her (real) freshman season and being told that 80% of the team’s scholarships would be taken away, Megan transferred toNorth Carolina State Universityin Raleigh. Throughout her five years of college, Meg was back every summer to train with our Canadian National Team. The first summer she was training with the B team, the next summer she made the A team but went back to college early for spring/summer training, and then last year she was part of our Senior A team and traveled to all the major competitions, including World Championships. Two years ago was Megan’s first professional stint playing volleyball abroad. 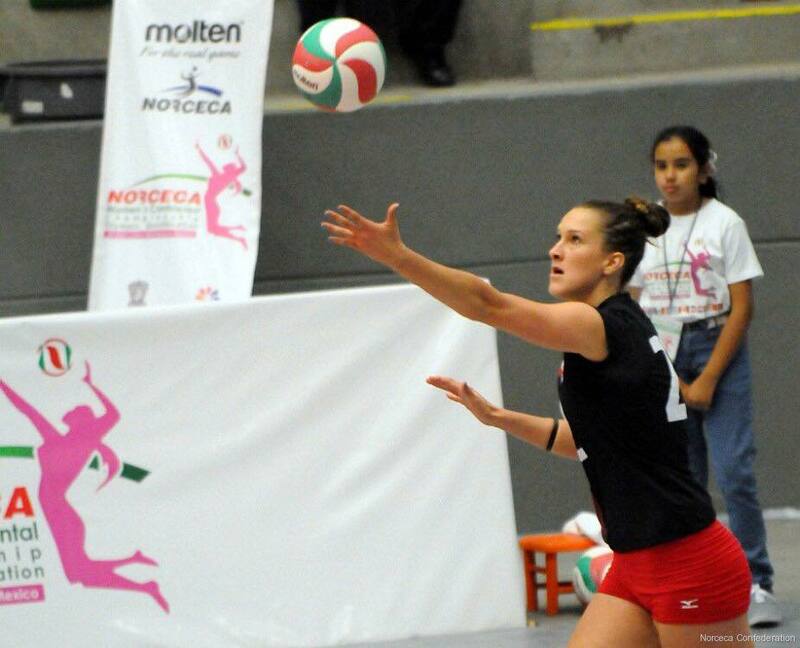 She played in Stuttgart, Germany with Canadian teammate, Becky Pavan, and last year in Neuchatel, Switzerland. This fall she has rejoined her Swiss team. Megan is truly a special teammate. She’s one of those players that keeps her head down and works as hard as she possibly can. She’s never one to point fingers and she’s too busy worrying about how she can make the next set better for her hitters. She's a be-in-the-moment individual; either all in or out. Unfortunately at the beginning of this summer, Meggy started questioning her love for the game. She decided to take a step back from our National Team program to give herself the opportunity to really see what she wanted to pursue in life(you can read more about it here). Days later she realized she had made the wrong decision; she wasn’t ready to say goodbye yet. As our training in Winnipeg had already started, Megan had to live with her decision and in doing so, kept busy with friends, family, and coaching throughout the summer. She resigned at her Swiss club and went to join them at the end of August for pre-season. Near the end of the summer, our starting setter Jen was struggling with a knee injury. With our third setter back at school we only had one setter (Dani) in practice for a couple of weeks which made it a tad more difficult to practice the things we needed to. Megan was contacted and asked if she would be willing to temporarily leave her club in Switzerland and fly back to Winnipeg to train with the team. She said yes instantly. Even though it was not guaranteed she would travel with the team(as it was all dependent on Jenn’s injury), Megan was stilljumping at the chance to be presented with this opportunity. A few days later, she was on the plane back to Winnipeg and back on the court with us. She came in to our team with a fresh perspective and positive mindset. To see all of my teammates react so positively to her return was very reassuring to me. She allows her teammates to have the capacity to make mistakes and learn from them, all the while still supporting them throughout practices and games. It's tough to be able to describe this extremely special teammate and friend in a blog post, but if you ever have the opportunity to meet her, even if only for a few seconds, you'll completely understand where I'm coming from. What have you learned from taking a step back this summer? "Oh boy. I have learned more about volleyball, my athletic career, and myself as a person than I ever thought I could. In short, I learned that volleyball is my gift. I have been given this ability to play for a reason and I need to do as much as I can with it while I am still able to. I learned that my athletic career has had its ups and downs. I feel like I still have not reached my full potential and there are many more highs and beautiful things to experience.I learned that I never really knew why I was playing volleyballbefore this summer. I felt like I was in a cycle but did not know my purpose. After having a lot of time with my thoughts and emotions I have figured out why I play and who I play for. I play because I can and I play for those who cannot." What’s the best thing about Team Canada? "Hands down the best thing are the girls. I missed them so much this summer and my heart was broken. Even though I lived 45 minutes from everyone, it was too hard to see them and not be a part of the team. I feel likeI have my family back.The second best thing about being a member of Team Canada is the ability to inspire. This is something I took for granted prior to my decision this summer. I did not realize how much power I had to inspire and motivate kids, teenagers, and adults around the world. I feel like up until this point I have never used my gift to the full extent and I am more motivated than ever to do something great with volleyball. I have lots of ideas on ways to give back and may be teaming up with another Team Canada member... so stay tuned!" Most inspirational person? "The most inspirational person in my life changes all the time. Currently, I get every day inspiration from two people; my Grandpa Shawwho is battling cancer and my best friendMadison Sutherlandwho has been through more than most should go through at her age. Both of these people exemplify strength and courage. Despite their circumstances they both always have a smile on their face and continue to live life to the fullest. My Grandpa is in a lot of pain and has slowed down a lot this past year, but I will never hear him complain or feel sorry for himself. He is constantly uplifting to me and exemplifies everything it means to be a husband, father, and grandfather. Every time I start to feel down I just think about my grandpa or Madison and everything is once againput into perspective. Madison is one of the kindest and most caring souls you will ever meet. She is a warrior and inspires everybody around her. I just recently visited her at her school where she is in her first year of teaching and I am so proud of how far she has come in one year and how she has not stopped pursuing her goals throughout adversity. No judgement on the story to follow:"I hit a cyclist with my car in college [I said no judgement]. Someone above must have been watching out for us because I hit him so hard and he flew into the highway, but somehow was perfectly fine. In fact, after I got out of my car my legs collapsed and I fell to the ground balling my eyes out, and HE ran over to me to make sure I was okay. The cyclist had a red slushie in his hands so when he hit my front windshield, all I saw was red liquid flying everywhere. I swore it was blood. His bike was in shambles but the cops felt too bad for me to actually give me a ticket and the cyclist was the nicest guy I could have ever hit." Casual story. No judgement, Megan. Meg graduated with a bachelor in Communications and minor in Journalism. She loves baking and cooking - any chance to bake for her teams, she will(yes please!). The last couple years playing overseas have her believing that her cooking is restaurant worthy. And it probably is. Figure skating was the first sport Meg fell in love with and competed at a high level until, as she so eloquently puts it, "hit my growth spurt at 13 or 14 and then things just got awkward." What do you want to do when you’re finished volleyball? "When I finish volleyball I want to inspire. Originally, I wanted to go to graduate school, be a graduate assistant coach with the school volleyball team, and then eventually coach. After coaching I would love to pursue a career in counseling. I still want to do all of those things one day, but before I do, I want to give back. I want to change lives and inspire kids. Sometimes I feel guilty for all the opportunities I have been given because I ,feel like so many people have helped me out my entire life and it makes me sad that so many kids have no one in their corner. I need to do something greater than myself and greater than the sport of volleyball before I step into a career." She’s a “live in the moment” individual. Having decisions already made stress her out. A lot.She would much rather“fly by the seat of her pants". Meg gets mad cases of food-envy. The last time Dana and I went to brunch with her, we all had to order the same thing just to make it easier for everyone. She desperately wants to go viral. Ordering from Starbucks, The Cheesecake Factory, and getting a manicure, all cause Meg anxiety. She says that she always ends up choosing the wrong colour, the wrong drink, or the wrong kind of cake. "I had a near death experience driving up North to Swan River, Manitoba. I was on a two lane highway going 110km/hr when I was approaching an oncoming truck. We were getting close when all of a sudden a massive (MASSIVE)couch flew out of the back of his truck and came spinning in the air at my windshield. It all happened so fast and so slow at the same time. Fast because I couldn't do anything except drive straight and keep my foot on the gas and slow because I saw the couch basically lift up over my car, fly over top as I watched it soar above my sun roof, and then crash down to the highway directly behind my car. It took me a good ten seconds to realize what had happened and then pulled over and cried my eyes out. I swore I had an angel lift the couch up over my car that day. "Only Megan. Meg adores her four grandparents. She has lived 15 minutes away from them her whole life and they are the first people she sees when she comes home. "The greatest humans I have ever known and will ever know. I try to talk to them at least once every 1 - 2 weeks while I am overseas." Her parents make the best brunches / feasts. And send the BEST care packages eveeerrrrrrrrr! As stated previously, she has asugar addiction. She once bought chocolate on the road and had to air-tight siran-wrap these goodies so she wouldn’t be able to eat them(all). Her parents live in Selkirk, Manitoba which is about a 45min drive from our practice gym at the university, which she drives every morning. Anything that pops in to Megan’s brain, she’ll say it out loud. "I think people, friends, family, relationships, and connections are my favourite things on this earth. So humans are my favourite.However, I would not consider myself an extrovert. Or maybe I am... I don't know. I am quite complex don't you think?" Meg hates making plans and will avoid doing so atall costs. She understands that she is a tad scatterbrained... indecisive... and just straight up hates committing to things with a definitive yes. It's best to make plans with her ten minutes in advance. She doesn't have a favourite food or favourite colour because there are just too many to choose from, and well, her mind changes all the time. "My childhood was pretty standard. I fell off my chair at the dinner table on a daily basis, tortured the crap out of my cat "Smudgie" (see the cat photo at the top of the article... and her mischievous grin... poor Smudgie...) because I just loved her so much, and regularly dressed up in the strangest attire and talked with my stuffed animals as if they were humans. My parents were a bit concerned, but I managed to turn out okay."